Check out the new Demo Section. New paper on the Coconut Model at JASSS. 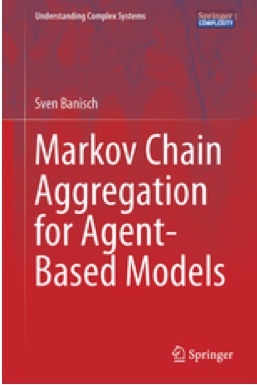 For my doctoral thesis I have worked on mathematical descriptions of Agent-Based Models as Markov Chains. Of particular interest has been the formalization of micro-macro transitons in these models in order to address questions related to aggregation, complexity and emergence. Under special circumstances (namely in the presence of symmetries) the transition from the micro to the macro level of observation preserves Markovianity and Markov chain tools can be applied to understand the model dynamics. More generally, however, Markovianity is lost for the macro-level dynamics which means that memory effects are introduced by the way a system of interacting agents is observed. An analytical treatment of a simple opinion model with contrarian behavior is presented. Starting from a microscopic Markov chain descritpion we derive a macro chain for the complete graph as well as a meso-level description for the two-community graph composed of two (weakly) coupled sub-communities. In both cases, a detailed understanding of the model behavior is possible.. More importantly, however, this setting provides an analytical scenario to study the discrepancy between the homogeneous mixing case and the model on a slightly more complex topology. We show that memory effects are introduced at the macro-level when we aggregate over agent attributes without sensitivity to the microscopic details and quantify these effects using concepts from information theory. Together with T. Araújo (ISEG/TULisbon) I have inspected the similarities and differences between modeling principles in some well-known population genetics and social dynamics models. Intuitively, we expected that the outcome of a simulation will be strongly determined by an external force (e.g., via fitness landscapes) such that groups of individuals appear (and persist for some time) at the adaptive peaks favoured by (natural) selection. However, for systems with a fixed population size this is not that simple, especially in the presence of multiple adaptive peaks. It seems that adaptiveness and the capability to divide the population into distinct clusters of individuals (speciation, splitting) are two dynamic qualities that are not easily obtained by one and the same update mechanism. In the Master Thesis project I developed and analysed a computational model of opinion exchange dynamics. Systematic computations as well as analytical arguments are used in the model analysis, and the empirical relevance of the results is discussed using real data. The model is based on a representation of opinions as a series of bits representing different issues in the agents mind and the interaction follows the conceptual formula that similarity leads to interaction and interaction leads to still more similarity. It was possible to show that non-trivial social structures - communication networks and opinion pluralism - emerge from very simple rules for individual communication. This emphasises the crucial role played by mutual interactions among individuals with diverse opinions and attitudes in the formation of complex structures found in society. A comparison to a series of recent network studies shows that important structural properties are reproduced by the model. Finally, an artificial election process is performed on the transient opinion profiles and the results are compared to real election data. Remarkable statistical agreement with the empirical data is found. The thesis also presents an idea to study by analytical means the dynamical process that leads to polarisation, plurality or homogeneity. One of the main results is that the introduction of a confidence threshold leads to the creation of new final states with the co-existence of different opinions. Opinion plurality is thus the result of agents with bounded confidence. 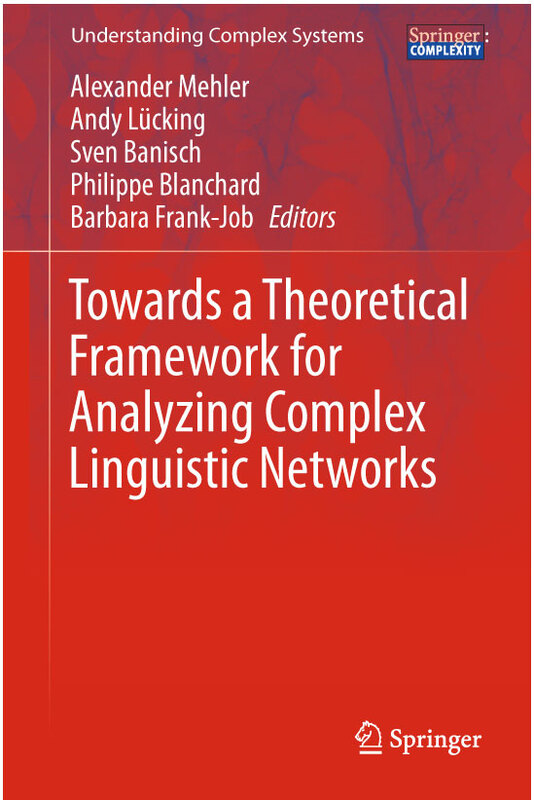 The method provides an analytical explanation of the convergence behaviour of this and other opinion models. "Bifurcations on the Sugarspace" was a small project at ISCTE (Lisbon University Institute). It was actually the result of a course on "Simulation of Social Systems" held by Jorge Louça, in which I learned that, in the social sciences, one main approach to understanding complex systems is agent-based simulation (ABS). A natural or social system is created by placing a number of individuals in an environment, and by defining simple rules of interaction in between the individuals, as well as in between the individuals and their environment. I had previously worked with dynamical systems and this project was a first attempt to combining ABS and dynamical systems. For the well-known sugarscape model, the paper "Bifurcations on the Sugarspace" (pdf/500KB) presented at the ICC-WCSS conference (Lisboa, January 2008) showed that a better understanding of the global properties of ABSs is possible when looking at these simulations from a qualitative viewpoint. Though taking another perspective now, my current research is somehow a continuation of this work. In the second Master project (done with M.Sbert at University of Girona), I had the possibility to continue the research of discrete dynamical systems. 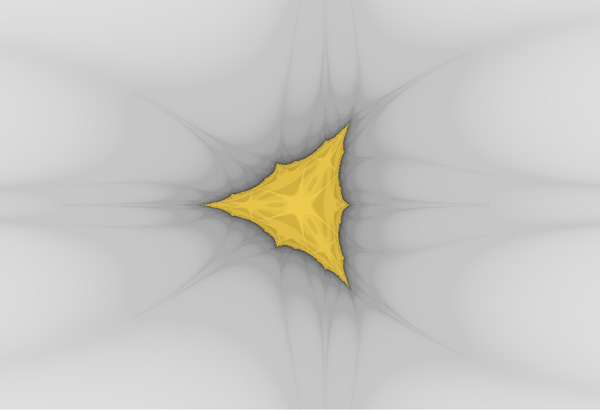 I developed an interactive software tool for fractal shape exploration and modification. The software is called AttractOrAnalyst and it implements a fast algorithm for the visualization of fractal structures using new graphics hardware. 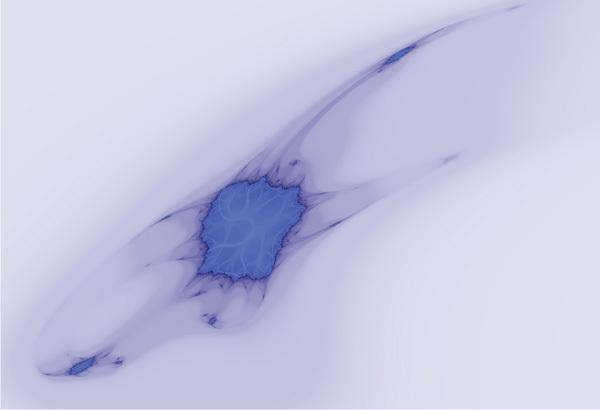 The real-time visualisation of fractals allows that parameter changes can be applied at run time. 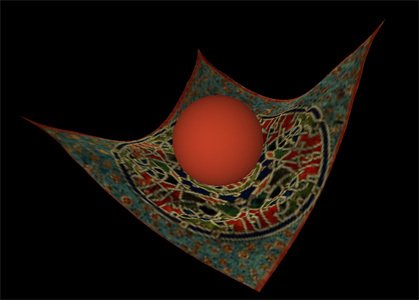 This enables real-time fractal animation which can be very useful for artistic work. Synchronising the parameters to music, for instance, could make the software an interesting tool for VJ work. Moreover, the AttractOrAnalyst makes possible an extended analysis of the discrete dynamical systems used to generate the fractal. 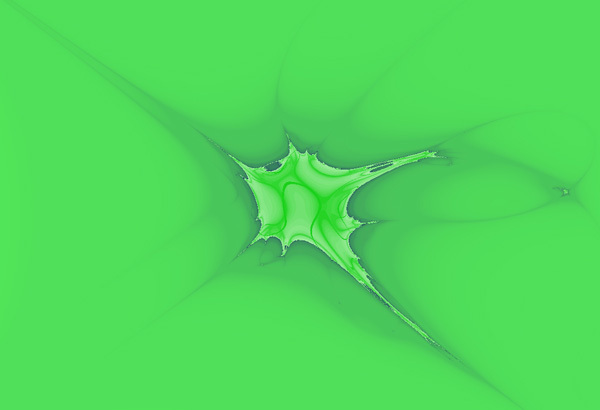 For a fast exploration of different fractal shapes, a procedure for the automatic generation of bifurcation sets, the generalizations of the Mandelbrot set, is implemented. 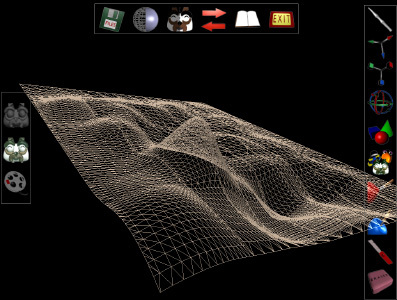 The software also implements methods for the graphical analysis of 2D dynamical systems. In the project documentation (pdf/13MB), these concepts are considered in detail. 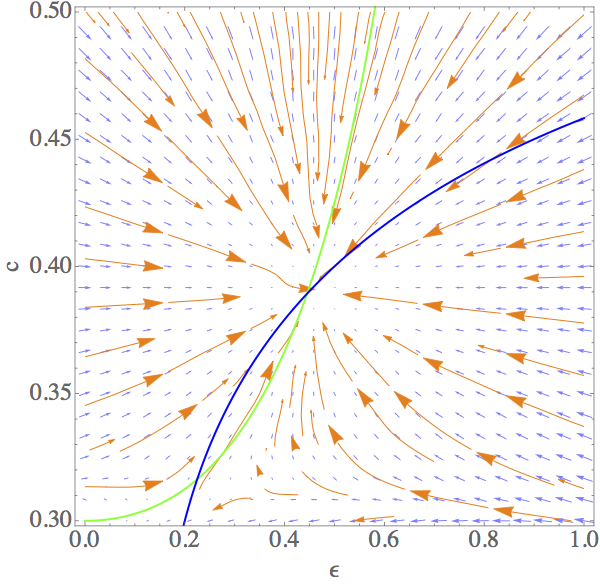 With the first project for the Master, done at the department of applied mathematics (Prof. K. Gürlebeck), I entered into the field of dynamical systems. The fact that researchers found with it a receipt to gain an insight into a series of real-world processes and problems, many of which have been inaccessible by other mathematical disciplines, is still a big motivation to work with these systems. In the project, we used discrete dynamical systems to achieve a reliable simulation of different traffic systems. It was called "Verkehrssimulation auf Basis diskreter dynamischer Systeme" (Traffic Simulation Based on Discrete Dynamical Systems). The project was divided into two parts: (1) the development of a simulation program for the numerical simulation of different traffic situations, and (2) a qualitative analysis of the discrete dynamical systems used in these simulations. I was mainly involved into the latter part, using analytical means to find out in which cases a crash a likely to happen. If you are interested, you can download the project documentation, "Verkehrssimulation auf Basis diskreter dynamischer Systeme" (pdf/4.4MB). In the first year of the Master Studies (from September 2005 until August 2006), I worked as a scientific assistent at the CoGVis/MMC Group (BUW, Faculty of Media) under Prof. Charles A. Wüthrich. 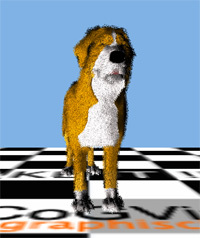 The CoGVis/MMC Group is mainly working in the field of Computer Graphics, real-time animation and physical simulation. 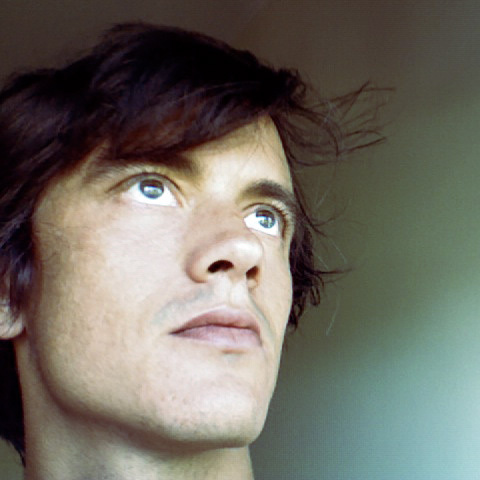 One of my main responsibilities was to take care of the project "Physics in Real-Time - PhiRT" (ws05/06 and ss06), which emerged from the project "Puppets & Hands". In this project, various different ways of a fast simulation of deformable 3D structures have been investigated. Additionally, I had to prepare exercises and tutorials for the courses "Algorithmen und Datenstrukturen", "Computer Graphics" and "Animation" (all ws05/06). Here (pdf/3.2MB), an overview over the different research topics at the CoGVis/MMC Group is available. You might also be interested to take a look at our publication "Real Time Simulation of Elastic Latex Hand Puppets" (pdf/2.4MB) which was presented at WSCG2006 in Pilzen. "Making Grass and Fur Move" is the title of my final project for the Bachelor Degree. It was defended in Spring 2005. The project aimed at a realistic real-time animation of grass and fur, mainly, by introducing physical laws to achieve an improved dynamic simulation. In the thesis, several different physical models are developed and compared to each other with regard to quality and performance. If you are interested, you can download the thesis (pdf/20MB), but there is also a published version (pdf/3.4MB) which was presented at the WSCG2006 in Pilzen. Furthermore, you might get an idea of the method by watching the ancompanying video (avi/14.3MB) and you can also try out several demo applications available below. From October 2003 to April 2005 I took part in the research project "Puppets & Hands" directed by Prof. Charles A. Wüthrich (BUW, Faculty of Media, CoGVis/MMC Group). The basic idea behind this project is a realistic interactive animation of elastic hand-driven puppets, as they are used, for example, in the field of educational television for children on the Philippines. 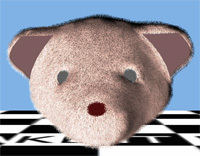 For interactive puppet simulation, a wide range of different methods must be combined in one model, and the whole system must perform at real-time rates. 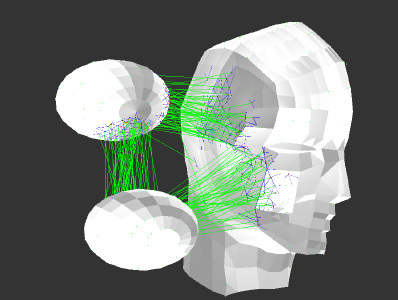 Among others, the following items had to be addressed: (1) the realistic visualisation of different surface structures and materials, (2) sophisticated algorithms for 2D and 3D mesh generation, (3) a stable implementation of the datastructure, (4) and the development of a physical system for the simulation of elastic 3D structures. During the project, I was mainly concerned with the physical simulation. In order to simulate elastically deformable materials, such as latex or foam, a mass-spring solver based on an implicit integration scheme has been implemented. The system allows to assign different parameter values in order to simulate different material properties within the 3D mass-spring structure.